Alejandro Zapata is an Authorized Rhino Trainer (ART), and a self-taught 3D artist specialized in inorganic modeling. 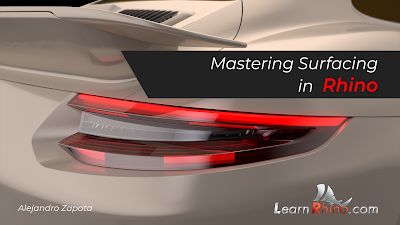 He has published his book, Mastering Surfacing in Rhino and it's for anyone who wants to improve their surfacing skills and achieve curvature continuity surfaces without plug-ins and expensive CAD software. It's a detailed step by step exercise to model a car and includes detailed illustrated explanations to why we use commands in certain cases, starting from a blueprint. The input is a simple blueprint and reference photos. Step by step explanation of the entire modeling process. 1200+ pages full of the illustrated workflow. More than 110 tools to learn. Explanation of key tools including surface analysis. Icons of all tools used in this book arranged in order of application. Watch this video to see what you can learn from Zapata's book (in Spanish here). To purchase or learn more from the book, visit this link.